Sleater-Kinney and Kathleen Hanna helped light a flame that still powers the likes of Waxahatchee and Courtney Barnett. In some ways, the Julie Ruin, Courtney Barnett, Ex Hex, Sleater-Kinney, and Waxahatchee are all on the same page. Kathleen Hanna wrote the Riot Grrrl Manifesto in 1991, in the process helping to spark a DIY subculture of angry, inspirational girl music and a feminist movement that fought to undo the silencing of women's thoughts and opinions on sexual assault, politics, creativity, and anything else they wanted to talk (or write or sing or scream) about. Hanna's manifesto overflowed with messages of love and support toward other women, but its language was hardly warm and fuzzy: "We must take over the means of production in order to create our own meanings," she wrote. "We are unwilling to falter under claims that we are reactionary 'reverse sexists' AND NOT THE TRUEPUNKROCKSOULCRUSADERS THAT WE KNOW we really are." "We are angry at a society that tells us Girl=Dumb, Girl=Bad, Girl=Weak." Maybe it's because these words feel just as powerful and necessary nearly 25 years later that so many new female-led groups have emerged who owe their existence to first-wave riot-grrrl bands. 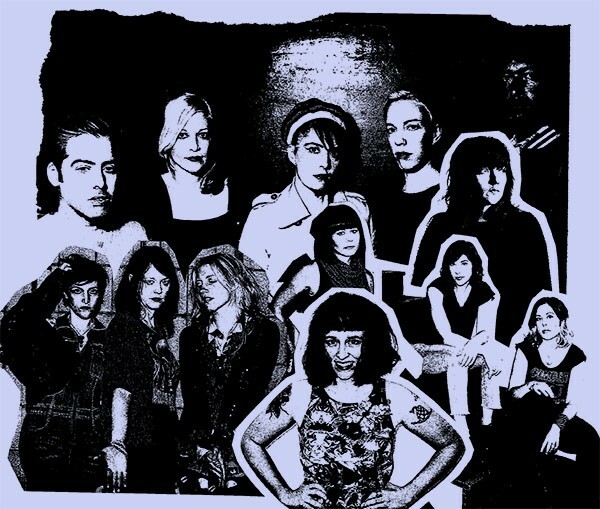 Hanna and Bikini Kill comrade Kathi Wilcox were scheduled to play Pitchfork last year in their current project, the Julie Ruin, but canceled due to a resurgence of Hanna's Lyme disease—the same ailment that had caused her mysterious disappearance from the scene in 2005. The next year, fellow riot-grrrl pillars Sleater-Kinney played their last shows before going on hiatus. It's almost poetic to see both artists on the same festival bill a decade later, with their original messages still blazing loud and clear (albeit set to slightly more mature sounds). Mary Timony, their partner in feminism, hasn't taken much of a break since the 90s, but her newest band, Ex Hex, is no less exciting for that. Their debut album, released last year, helps connect riot-grrrl feminism to younger Pitchfork artists such as Waxahatchee and Courtney Barnett—whose tendency to prefer conversational singing or ambient crooning over rebel yelling doesn't dilute their strong points of view. In fact, much of what these newer acts have to say can be related directly to the ideals in Hanna's manifesto. On Waxahatchee's "Poison," Katie Crutchfield muses, "What do I want, what do I think / Nobody hears," while Barnett takes a more aggressive stance on "Debbie Downer": "Don't stop listening, I'm not finished yet / I'm not fishing for your compliments." Whether paired with Crutchfield's bedroom guitar or delivered in Barnett's deadpan voice, these sentiments aren't far from what Hanna sang in "Rebel Girl" to kick-start an ever-evolving revolution that seems to have no end in sight: "When she talks, I hear the revolution / In her hips, there's revolutions / When she walks, the revolution's coming / In her kiss, I taste the revolution!" Kathleen Hanna has found her way back to the energy, toughness, and joy of her Bikini Kill days. These bars and restaurants are just a short walk from the Pitchfork festival grounds.